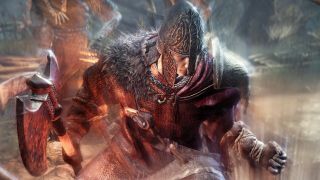 Dark Souls games are difficult, yes, but they're also amazing horror games, albeit with a dark fantasy veneer. The trailer above isn't necessarily in keeping with the 'spirit' of Dark Souls 3, but it's thoroughly enjoyable to imagine Miyazaki's world as a straight-to-video B-grade horror film. Oh, and there are some grief glimpses of gameplay footage in there too, buried in the VHS grain. That's not where the weird Dark Souls trailer shenanigans end, either: Eli Roth, director of the Hostel films, has also contributed to the hype campaign. His trailer isn't in keeping with the spirit of the games at all to be honest, but it's worth a look if you want to see a cartoon warrior being force fed a cauldron of lava. Of course you do! It's embedded below. Dark Souls 3 releases April 12. James is working on our review as I write, and he's already written up this collection of tips for the opening hours of the game.